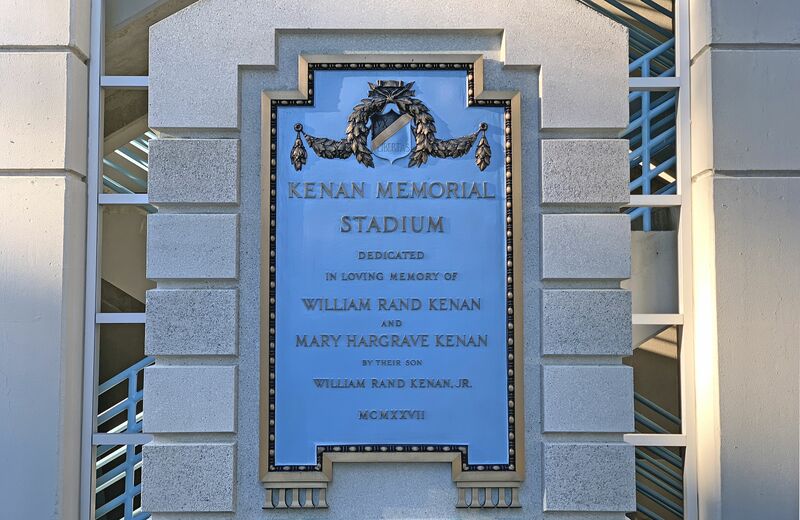 The University will remove the name of William Rand Kenan Sr. from the plaque at the north gate of Kenan Memorial Stadium on which the stadium is dedicated to Kenan and his wife, Mary Hargrave Kenan. Kenan, a member of the class of 1864, was deeply involved in the infamous 1898 incident in Wilmington in which dozens, maybe hundreds, of black people were killed in a violent overthrow of the town’s government. Kenan, a veteran of the Civil War, was in command of a squad that operated a rapid-firing machine gun from the bed of a wagon. According to accounts of eyewitnesses, the gun was used to fire into the homes of black residents and to intimidate others. Long portrayed as a spontaneous race riot, more recent research has recast it as a successful coup d’etat. The legitimately elected town government of the short-lived Fusionist movement in the Reconstruction era in which blacks played prominent roles was overthrown in an elaborately planned action involving some 450 white men. Blacks were rousted from their homes and killed or run out of town, and the black-owned newspaper was burned. Estimates of the number of blacks killed range between 60 and 300. In the summer of 1926, as fundraising for a new football stadium was not going well, William Rand Kenan Jr. (class of 1894) stepped in with a $300,000 gift that covered the cost of the stadium and field house. The project was finished nine months later. Kenan Jr. had played on the football team, and he was interested in a memorial to his parents. The story of his father’s involvement in the Wilmington coup has received little attention, even as the University has gone through changing the name of one building named for a white supremacist and has dealt with the recent forced removal of the Confederate monument known as Silent Sam. Last month, a writer for NBC Sports wrote an extensive account of the Wilmington events and focused on Kenan Sr.’s involvement. Subsequently, The Daily Tar Heel published an account that dominated its front page. Several books have covered the coup in Wilmington in detail. A task force is in the process of designing signage for the McCorkle Place quad, UNC’s oldest ground, to explain the University’s racial history. The task force will take on an account of Kenan Sr.’s history for the stadium. The Kenans have been involved in UNC’s leadership since its earliest days, and their philanthropy is everywhere on the campus — at the Kenan-Flagler Business School and in several academic disciplines, in grants to the arts and endowed professorships. Much of it has come through the Kenan Charitable Trust, started with money bequeathed by William Rand Kenan Jr., who left most of his $95 million fortune to UNC. It was not immediately known how soon the plaques would be replaced. The UNC Library’s Virtual Museum of University History identifies 10 people for whom buildings on the campus are named — including six residence halls, two classroom buildings, an administrative building and the student bookstore — who had ties to white supremacy. Kenan is not among them. The complete list of those honored with namings is at https://museum.unc.edu/.